Kiyoshi Kurosawa's family drama Tokyo Sonata was named best film Monday evening at the Asian Film Awards gala held in Hong Kong. The evening was dominated by Japanese films, with Tokyo Sonata, Still Walking and Departures taking home four of the top prizes. Motoki Masahiro scooped best actor for Departures, the 2009 Oscar winner for best foreign language film. Masahiro plays a cellist who moves back to his hometown and reconnects with his past after losing his job. Still Walking, Hirokazu Koreeda's drama about the dynamics of a family reunion, especially the impact of a family member long dead, earned him the award for best director. Koreeda said Still Walking was a personal film which he made after his mother passed away. Japan's Joe Hisaishi won the best composer AFA for his work on Hiyao Miyazaki's hit animation Ponyo On the Cliff by the Sea. 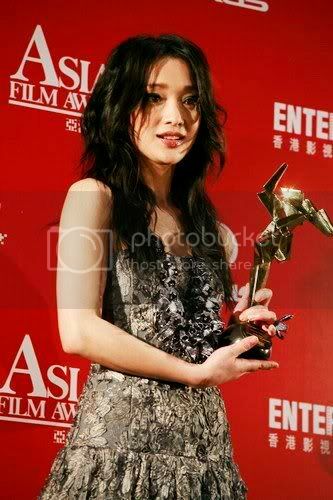 Best actress went to Zhou Xun, one of China's hottest young actresses who played a taxi driver searching for her boyfriend in The Equation of Love and Death, a mainland Chinese film by Cao Baoping. Zhou said she prepared for her role by asking her boyfriend not to visit her on set so she could feel lonely. "I felt a great sense of loss [after finishing the movie]," she said. The best newcomer honour went to Chinese actor Yu Shaoqun who plays the young opera singer Mei Lanfang in Chen Kaige's biopic Forever Enthralled. Korean actor Jung Woo-sung was named best supporting actor for The Good, the Bad, the Weird, which earned eight nominations going into the awards. Filipina Gina Pareno took best supporting actress for her role in Brillante Mendoza's Service. The Nielsen Box Office Award, presented by the trade publication the Hollywood Reporter, went to Bollywood actress Priyanka Chopra, 25. Hong Kong actress Michelle Yeoh headed the 13-person jury for this year's AFAs, which also included Noah Cowan of the Toronto International Film Festival.